By now you’ll have noticed an increase in bicycles on our streets (not just rusty ones) and the whoops of delight of their Hoërskool Zwartberg riders as they whiz by. This is thanks to the combined efforts of National Government’s “Shova Kalula” programme and a Cape Town-based non-profit organisation, the “Bicycling Empowerment Network” (BEN). 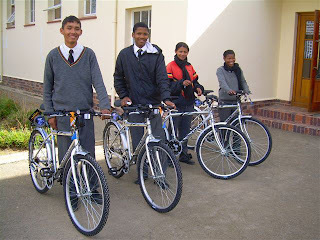 On 30 July 2007, Louis handed over 60 spanking new bicycles to Hoërskool Zwartberg. Learners lease the cycles from the school at R10 a month – this includes a lock and a helmet - and sign a rental contract for a year, undertaking to keep their bikes in good condition. They also need to pay R50 a year for insurance and have to return the bikes to the school during school holidays. Louis and his two assistants also spent some time training Hoërskool Zwartberg’s janitors, Hennie Ceylon and Koos Jacobus, in the basics of bicycle mechanics and repairs. At the time of writing, half the bicycles had been leased from the school. Several learners, who had never owned bicycles before, set off one afternoon to ride to Prince Albert Road and upon their return, declared that it “was the most fantastic thing they’d ever done!” As a result, some of their school mates are looking for part-time jobs to raise the funds they too need to “shova kalula.” The Friend has also learned that a number of teachers are casting covetous eyes over the remaining cycles! On the same day, BEN presented 30 bicycles to the Prince Albert Land Care Bush Camp run by André Gouws in the Prince Albert Valley. The camps, held throughout the year, encourage young people to be more caring of the environment and to live in harmony with Nature.